On a recent trip to Rockford, Illinois, the kind folks at the Discovery Center Museum provided me a fabulous tour of their TOP 10 children’s museum. Unfortunately, the kids weren’t with me. They would really have enjoyed it. But… since the kids weren’t there, I got a chance to play! I enjoyed many other exhibits during my visit. New this fall, the museum offers a great hands-on Simple Machines exhibit that allows kids of all ages to explore gears, levers and pulleys. The pulley chair-lift offers a challenging, laugh inducing display of the power of pulleys. Trust me… You have to try it! Another interesting center that I’ve not seen elsewhere is the Team Up! 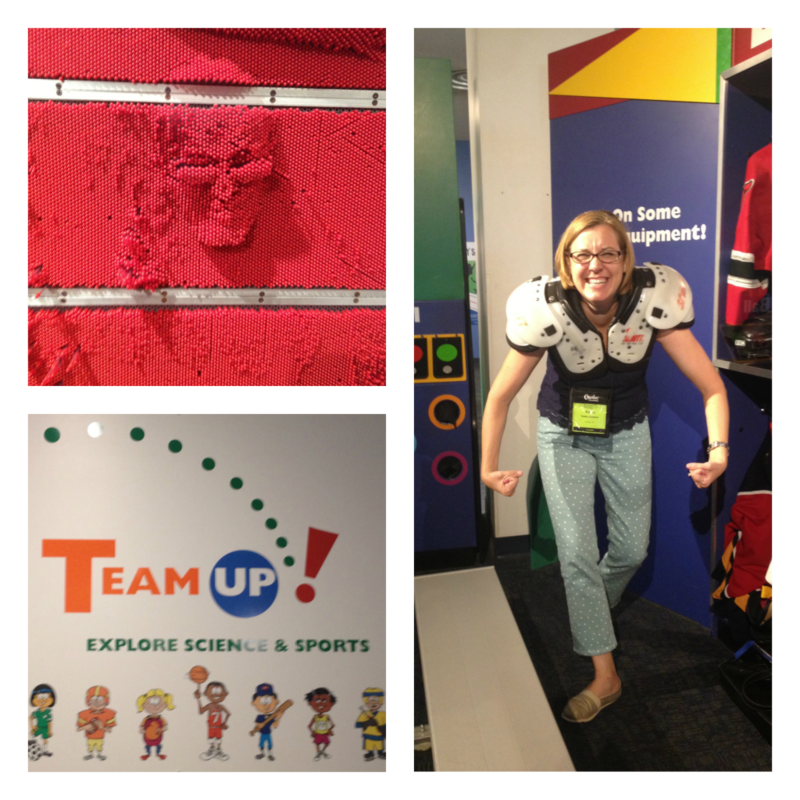 exhibit that allows kids to explore the science of sports. Adults and kids alike tried their soccer goalie skills, tennis and football gear. Yes, that’s me in the photo above right…. Looking tough! 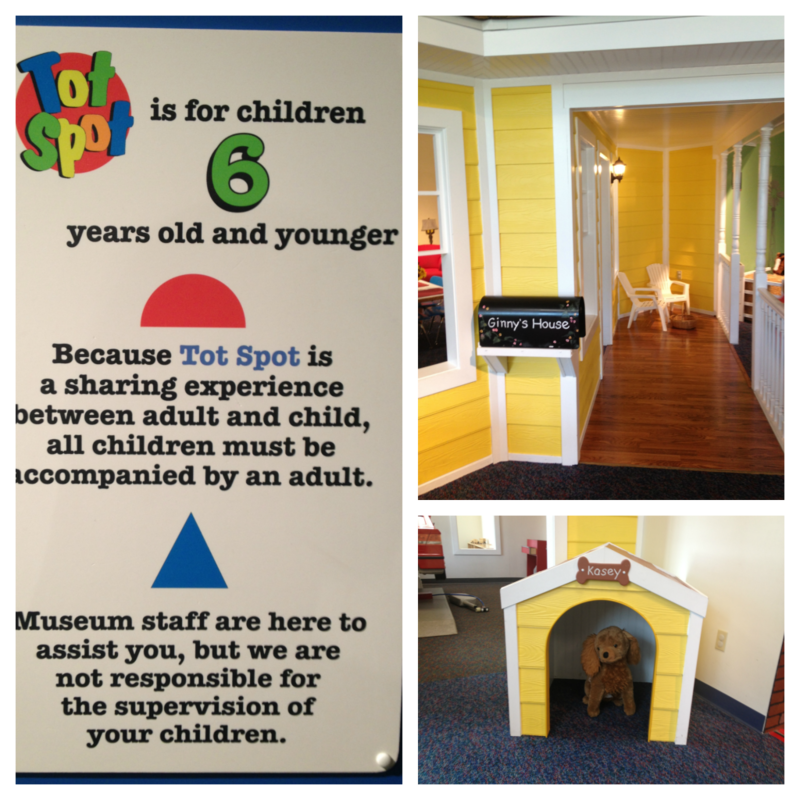 The Tot Spot exhibit, designed for kids ages 6 and under, has recently doubled in size and offers kids lots of play space. I was impressed with the play house that includes a garage complete with car and tools, front porch, and dog house. The water discovery exhibit allows many kids to explore the power of water at one time. A toy train, craft area, and more round out this spacious, light-filled area. Outdoors, the museum offers Discovery Park, an 8,000 square foot, 2-story maze and activity area. 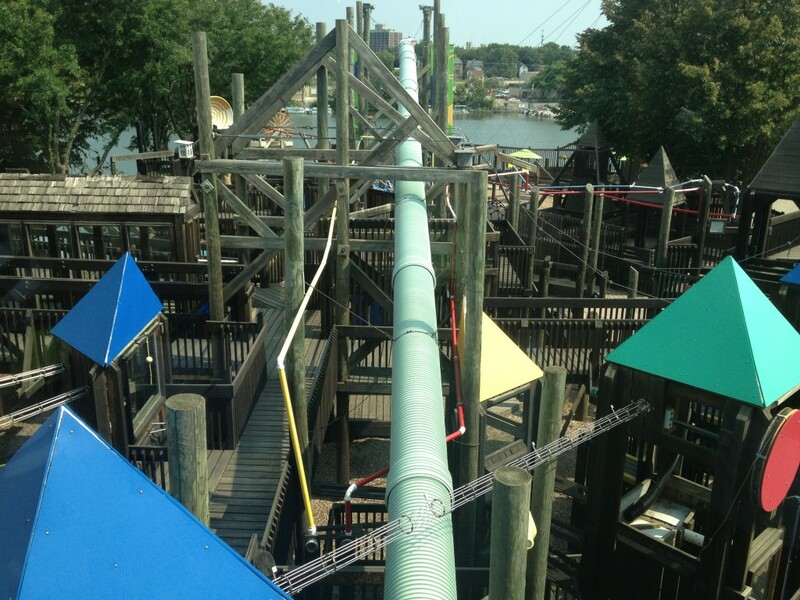 Besides climbing through the maze, the outdoor park offers hands-on activities to explore motion, sound and light. This park area is wheelchair accessible and offers only one entrance/exit. Parents can relax on shady park benches knowing their kids can climb and explore safely. The museum director shared that many parents bring their kids to the park after a day in Rockford to wear them out so they sleep on their drive home to cities and towns a couple hours away. Beyond the outdoor maze area, museum visitors can enjoy the river walk along the Rock River, even lunch on the waterfront. I enjoyed the high quality exhibits, but more than anything I appreciate the thought behind the exhibits. Because it’s a hybrid science center and children’s museum, the Discovery Center Museum appeals to a wide age of children, from toddlers to middle schoolers. Free for members and children age one and younger. Admission discounts are offered to those with reciprocal museum memberships. See your ACM membership for details. Burpee Museum of Natural History Same Day Discount. Receive $1.00 off general admission to the Burpee Museum of Natural History when you visit on the same day. These museums are located in the same area, offering families a full day of fun activities. Donation Days. The Discovery Center Museum regularly offers donation days, when families can visit and donate any amount in lieu of the regular membership fee. Call ahead to find out when the next Donation Day will be. Have you visited the Discovery Center Museum? What do you like best? We love the Discovery Center! It is one of our favorite places to go! That Discovery Park is awesome!! Fun! It is a fabulous museum, outside and in! How cool is the Discovery Center Museum! The picture of you football gear is too funny and that Discovery Park outdoor space is awe-inspiring. I want to go there and run around! Holly, We only had about 1.5 hours to explore. I wanted to stay! Oh how fun! I love when they combine science and discovery for all ages. 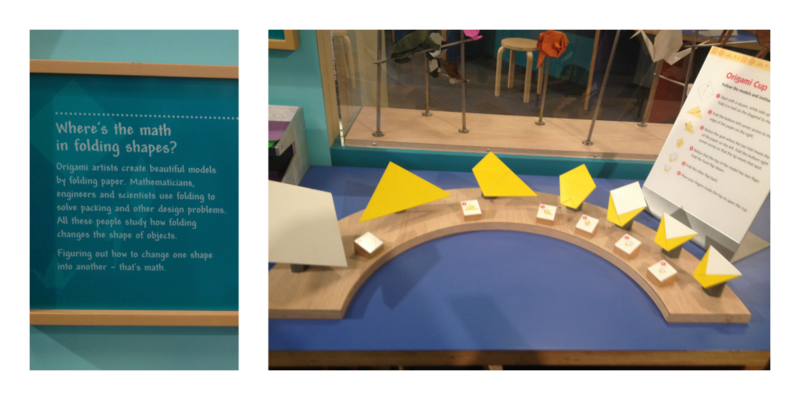 Kiera, I’m a huge fan of COSI, but this museum was more integrated. Parents can explore with younger kids while older kids explore nearby. Family friendly! What a fun sounding museum. Interesting pose in that football gear.